On Dec. 1, many people turned out at the selectman’s meeting at the Sharon Community Center to hear about the Algonquin pipeline/Access Northeast project and what impact it would have on Sharon residents. Click here to see route of pipeline through Sharon. 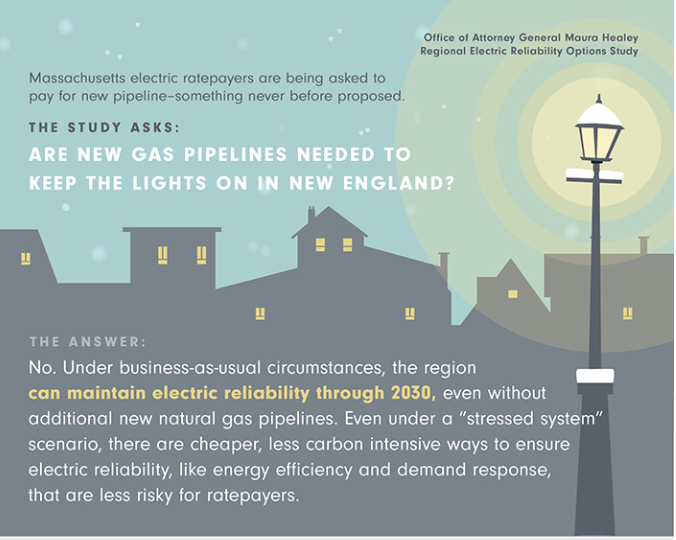 Representatives from Spectra made a presentation claiming that Massachusetts lacks pipeline capacity, despite the Mass. Attorney General’s report to the contrary. They said the project’s benefits would result in lower utility rates, but admitted that rates cannot be guaranteed as they are determined by the market. Most questions from the audience expressed concerns with the project and with the assumptions made by Spectra. One questioner pointed out the vastly higher safety incident rate of pipelines built since 2010 as compared to older pipelines built since 1940. Another expressed concern about the use of herbicides over the path of the pipeline. Several people asked the selectmen to present a balanced view on the town’s website. This project is in the open comment period for FERC (Federal Energy Regulatory Commission), the agency that will approve the project. Anyone can add their own comments on the Access Northeast/Algonguin pipeline expansion by using FERC’s e-comment page. 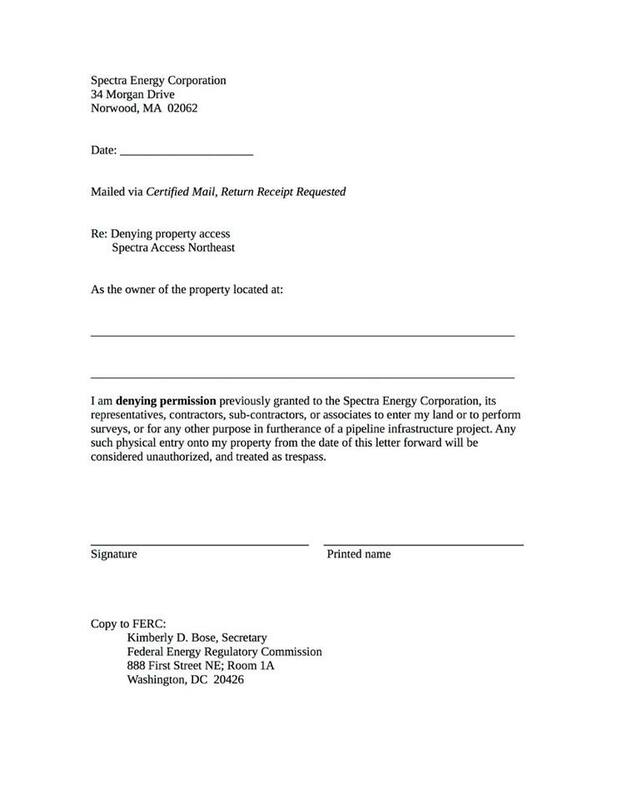 The FERC docket number is PF16-1. The comment period may be closing soon, so don’t delay. Individuals and towns can refuse permission for Spectra to survey their lands, which they are required to do to select a route for the pipeline. Click here to get a “deny property access” form. Local conservation laws and ordinances can be used to try to block the project. We will make full use of the required conservation hearing(s) in this capacity. Massachusetts and US constitutional law provides a legal basis to challenge private sector projects, such as this pipeline, to protect natural resources – including the air, water, forests – which are held in trust for all people and all future generations. For more information, visit: www.nosharongaspipeline.org | www.facebook.com/nosharongaspipeline | nofrackedgasinmass.org. Correct me if I am wrong but it appears the proposed pipe will follow existing rights-of-way used for high-tension electric transmission. This seems like a creative use of property that has already been “condemned”. You are correct that the pipeline will follow the transmission lines, but the proposed pipe is larger (30″ diameter) and needs more buffer space (150 ft?) on either side, and can’t be directly under the lines because of safety issues with electric current and pipes, so there will be encroachment on residential and conservation restricted properties. It’s cutting through Moose Hill Audubon, Moose Hill Farm, as well as wetlands. The gas lines that exist now were put in place decades ago, without regard for conservation. In fact, the Sharon Con Com was formed after the original gas pipeline went in.